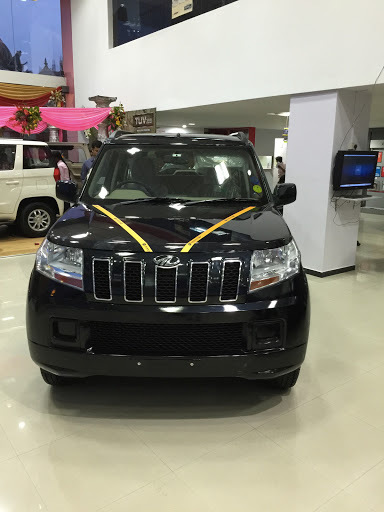 From a long time I have always been wondering how M&M vehicles have increased the costing of their vehicles without launch of any substantially new in the models out there. But then deep inside, they have been working hard to upgrade the current models with either higher quality of steering and dashboard materials, or gimmicks like the hybrid mode, rain sensing wipers, quality of seats, tiretronics, cubby spaces designs, toughened materials on the body, phone on steering wheels, sat nav, some cool looking alloys, etc. I find that on Scorpio the hybrid mode alone increases the mileage by 1km per litre of diesel. This said, its not hard to see how the company has reinvented themselves beyond the vehicle itself all the way from the assembly line to design to employee welfare and what not. The Tata’s on the other hand seem to be lost in a government office style working culture even through their products are finally showing a design betterment of late. Anyway, as I entered the showroom the other day, my expectations from the TUV 300 were not sky high as I knew its probably an upgraded version of the bolero or a slightly modified version of the Quanto. Everyone knows that, but what Mahindra have done here is seriously something different. Every manufacturer will reuse the parts from older vehicles while designing something new. But however, the stance of the TUV itself is quite imposing. After all its the same platform that the scorpio was built on. And it shows. Its majestic, rectangular, imposing and manly to look at. I did not quite like the font chrome stripes, and would have preferred it to be like the XUV, but then thats more of a design thing and I dont care much about details on the looks such as this one. So having said that, the next natural urge was to plonk myself in the drivers seat. And just as I had expected, M&M have replicated the Scorpio seating here inch to inch. The seats are very very comfortable and the ride height is just awesome. Its almost as much as the Scorpio but a bit less in my opinion. But it does not make a difference. The steering wheel is very nicely made with all due respect. 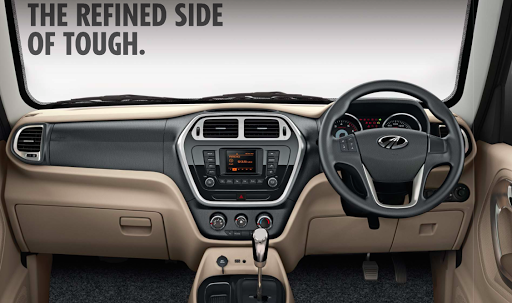 The interiors are well made. I did not see a climate control, but nevertheless the dashboard itself was of superior quality almost hyundai in nature. This is not the usual run of the mill Mahindra. Careful selection of materials has been adhered to. The seats are really plush, and very supportive. 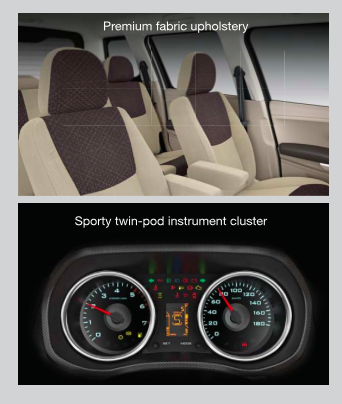 The dashboard panels, steering, instrument clusters are all very well done. The car gets all window buttons near the handbrake which is a bit of concern for me in 2015, but maybe its a matter of getting used to. The thing I like about Indian manufacturers is that they tend to understand Indian conditions well. So you get a rear washer and wiper without a question which I don't have even in my Nissan Sunny. You can notice how much space is there in the middle row, the flat floor, and all the cubby storage holes on all doors and near the handbrake. Awesomely done. Indeed. My only grouse is the storage panel on top of the dashboard could have had a lid like in the Mahindra XUV 500 which is a miss. You can notice that even in the rear door you can place huge bottles in the storage. The rear also gets jump seats which can at best accommodate children. But it apparently does not have seat belts which is not a good thing at all. Anyway what we are looking for is two adults or kids sitting in that seat for about 5-10 kilometres within the city if not more than that. Anything more than that and the discomfort shall be perceived. The car also gets reverse assist, voice controls, driver information system and static bending headlamps in the higher versions. I am yet to take the car on a test drive, and hope it will live upto its purpose as a true blue tough SUV. Its not clearly the best in creature comforts but then you also get what you pay for. Pay another 5 lakhs more and you will end up with the bigger brother the scorpio with all what you wanted within it. I have seen the auto car review of the TUV and for city drives it seems the right vehicle to go for. One of the grouses said in the review is the inability to remain powerful after 3500 RPM which is because of the 3 cylinder 84 bhp engine. For a non hassled driving style this car should still be able to give other sedans a run for their money. And the next time it rains horribly on potholed roads in Bangalore, you will thank your stars for being in the TUV 300. 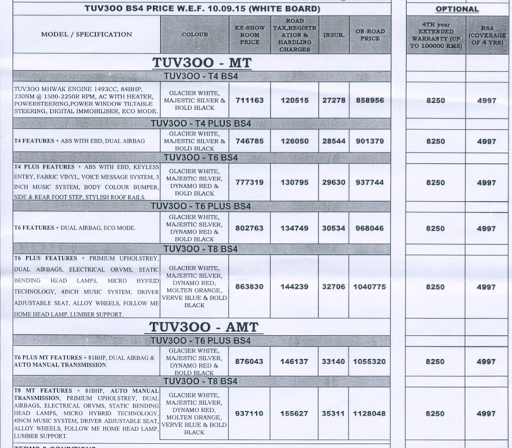 As a final note here is the price list of the vehicle in Bangalore City. The autocar review can be found here, for your viewing pleasure. And the manual can be found here. If you want to make your TUV look even more tougher, you can choose from a huge list of accessories described here. Hope you liked the information provided. If you did hit the comment section below to tell me what you liked most about the TUV 300. Enjoy your drive and wear your seatbelts.